Loving Care Senior Services, Inc.
"For those who deserve it most"
Loving Care Senior Services, Inc. is a part of the Home Health Care Network designed to inform the public’s interest on how to improve the well being of seniors by promoting healthy lifestyles. Loving Care Senior Services mission is to make lives easier, more convenient, and more comfortable for seniors who deserve it most. Loving Care Senior Services, Inc. has a medical team that consist of registered nurses, certified nursing assistants and clinical coordinators. Our specialized team will assist you with the following in the comfort of your home; bathing, dressing, meal preparation, medication reminders, light housekeeping, and grocery store shopping. Loving Care Senior Services is a provider for Montgomery County Aging and Adult Services, and the Philadelphia Corporation for Aging. Simply give our office a call for next day service. 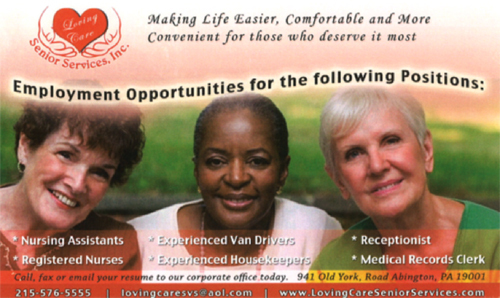 Call Loving Care Senior Services, Inc. today at 215-576-5555 with any questions regarding our Nursing Services. Loving Care Senior Services provides transportation for seniors 55 years of age or older throughout Philadelphia and Montgomery county areas. Loving Care is a member of the Shared Ride program. We are a Provider for PCA, and the Pennsylvania Waiver Program. This service is a shared-ride service and everyone must be able to share the ride with other passengers. Loving Care provides wheelchair accessible transportation. Our housekeeping department has experienced housekeepers that have over ten years of quality experience. Loving Care provides all the cleaning products required to clean your home. Our professional laundry service is a pick up and delivery next-day service. Our laundry department will wash, dry, and fold your laundry. We guarantee next day delivery service before 12 noon. All new customers receive a free laundry bag with their first service. 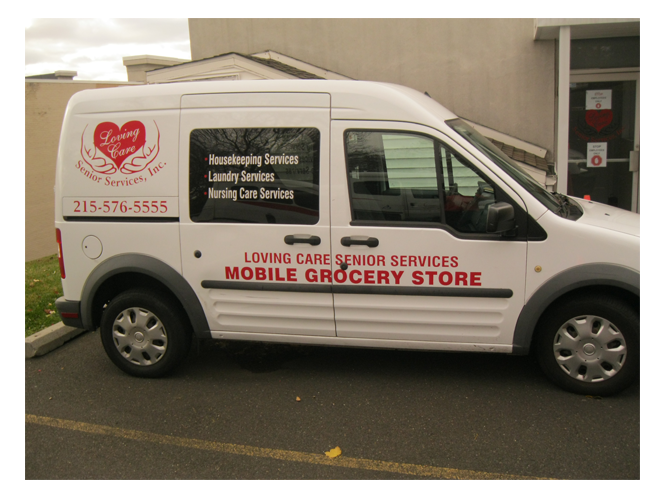 Loving Care Senior Services mobile grocery store provides a range of various items that includes: fruit, vegetables and household items to seniors who live in independent living facilities. The mobile grocery store is scheduled every day throughout the city of Philadelphia. To request a menu, simply call our office to pre-order if your building is not scheduled for service. "The staff at Loving Care was so kind and friendly to my parents, please keep up the good work!" "The housekeepers that came out to my moms home did a wonderful job. The housekeepers are very professional, and did exactly what we needed. I am now a monthly customer and very satisfied with the services." "The transportation service was the best I ever had for my Dad. The driver was very patient, professional and on time for my Dad's doctors appointment. I highly recommend this company to other seniors, they are the best."